Multicultural Columbine stopped by police. Three Taylor High School seniors were arrested Wednesday after officials said they made comments about committing a school shooting. The students — all 17 years old — have been identified as Devant Davis-Brooks, Kadin Watson and Emmanuel Tejas Pina. 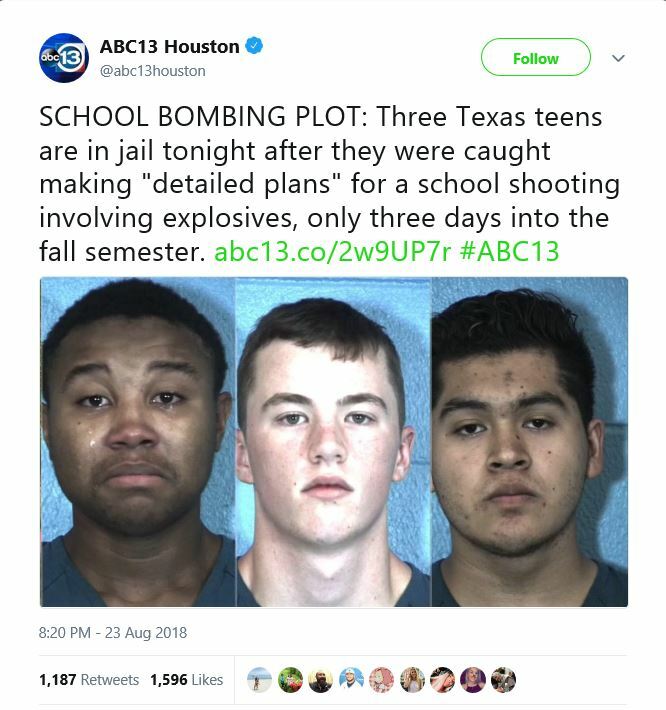 All three were charged with making a terroristic threat. Taylor police say while in class several students overheard the three suspects making “detailed plans” to coordinate a shooting at the school that involved explosives and firearms. Now, how real were those plans? How much credence did the authorities give to the threat? [Superintendent Keith Brown] says they’ll be suspended for three days, then they’ll be sent to alternative school before they can come back to class. Does not sound so dangerous but maybe a case of kids being verbally stupid discussing or talking about stuff that would set off all the appropriate alarms. And typical of the Clinton News Network, this has been swept under the rug as it doesn’t fit their progtard narrative 100%. Previous PostPrevious Alexadria Ocasio-Cortez bids fond farewell to Sen. McCain. Socialists lose it.